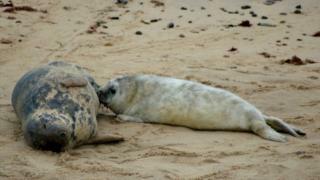 A record number of grey seal births at a Norfolk beach shows a "major change" in behaviour as the animals become used to humans, marine experts have said. The 1.5 mile (2.4km) stretch of dunes at Horsey has hosted 1,018 births so far this winter compared to the previous winter when there were 804. Dr Dave Thompson, biologist at the Sea Mammal Research Unit (SMRU), said: "The colony growth is spectacular. "These animals used to only breed on islands or sandbanks." Colonisation began in 2003 at Horsey, which is privately-owned with public access. The Friends of Horsey Seals volunteers erect ropes and warning signs and patrol the beach to try to ensure seals are not disturbed during the November to January breeding season. Peter Ansell, of the Friends of Horsey Seals group, said: "It's a milestone for us, given that it's a beach with public access. "We have no idea when seal numbers will peak, but presume this will be governed by the food chain, of which they are at the top." The SMRU, based at St Andrew's University, monitors the size of the UK seal population. Its statistics showed the number of pups had risen from 36,816 in 2002 to 51,293 in 2012 - the last year of its fully collated figures from the UK's main breeding sites. Mr Thompson said pup births at sites in the northern part of the North Sea were static and the trend was for growth in the southern end. "The Horsey colony growth is spectacular and it shows they've become more tolerant of humans in the vicinity," he said. "The growth in the southern North Sea is so rapid that it has to be partly down to immigration from northern breeding sites with the seals deciding the habitats are more suitable."